One of my signature images from one of my favorite wedding reception venues: Lombardi’s on the Sound in Port Jefferson, New York. Located high on a bluff in the Village of Belle Terre, this amazing waterfront venue provides sweeping vistas of The Long Island Sound. I have been affiliated with the Lombardi family for more than two decades and have garnered tremendous experience taking wedding pictures here, as well as at their other two locations: Villa Lombardi’s in Holbrook, NY and Lombardi’s on the Bay in Patchogue. 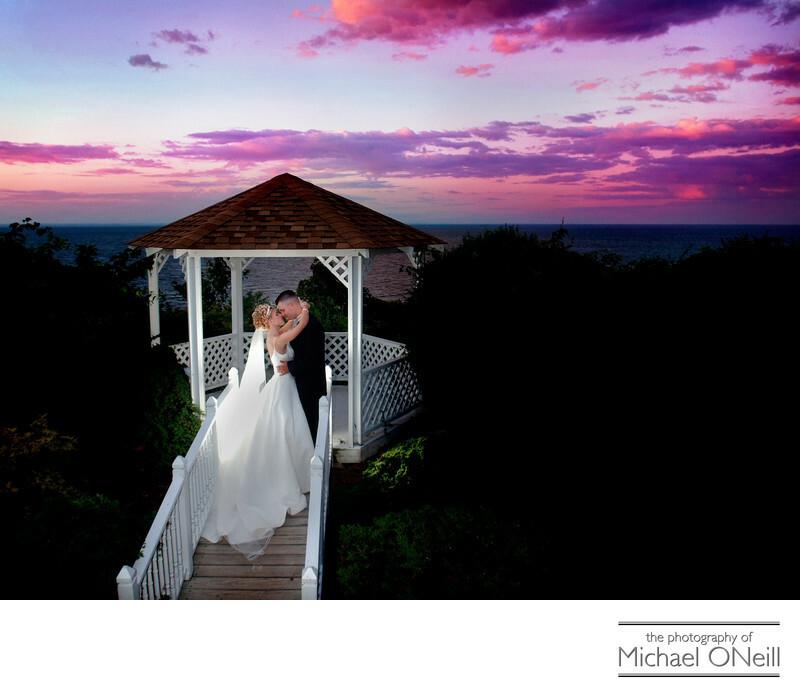 Lombardi’s on the Sound always holds the promise of capturing an amazing sunset wedding picture and this night certainly didn’t disappoint. So enough about one of my favorite venues and it’s favorite sunset. Let me talk a little about the bride and groom in this picture...one of my favorite couples of all time. Pamela and Sean were such a pleasure to work with...fun, animated and two of the most genuine, loving people I’ve ever had the pleasure to meet. I have stayed in touch with them...years now since their wedding...and have watched them start a family of their own. I’ve even had the pleasure of photographing newborn portraits of the couple with their first born daughter, Gracie. I am grateful, every day, that I get to make a living doing something creative and ever-changing; but I am more grateful for the opportunity I have to meet and work with wonderful clients and, ultimately, forge lasting relationships with them.